The picturesque and cosmopolitan island of Hydra is just a few hours away from Athens, making it a unique destination for quick trips. Hydra, because of the restored mansions, the picturesque harbor with the battlements and cannons, museums, quaint cobbled streets and the great maritime history and tradition of the revolution of 1821, is today the jewel of the Argosaronic. The town of Hydra, which is the only city of the island, has been proclaimed preserved and wheelees are prohibited. The transport is by donkeys or via water taxis, which start from the port of Hydra and connect the main village with seaside villages and beaches. The 1,966 residents deal mainly with fishing and tourism. It is spread over two rocky hills built amphitheatrical and bustling with traditional houses with tiled roofs, blue doors and windows. It owes its name to the abundant water that gushed from the rich sources it had during old times. At the entrance of the harbor you can see the imposing cannons that once protected the city, the statue of Andreas Miaoulis, the Historical – Archive Museum of Hydra and on the port are dozens of souvenir shops and cafes. The crystal clear deep waters can be enjoyed both in areas close to the port that are accessible on foot as the “Cave”, “Hydroneta” and “Avlaki” but also in beaches as the “Kamini”, “Vlycho”, “Mandraki”, “Saint George – Bisti” and “Saint Nickolas” which are all accessible by the shipping lanes with small boats that start from the harbor every half hour. 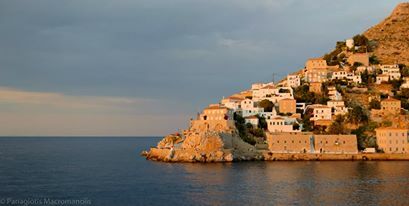 Hydra is connected by ferry throughout the year with Athens and the other islands of the Argosaronic as well as Ermioni – Metochi. You can anchor a private yacht in the main harbor, Mandraki, west of the port, Kamini, Vlycho, Palamida, Bisti, Molo, Saint Nikolaos and Dokos.